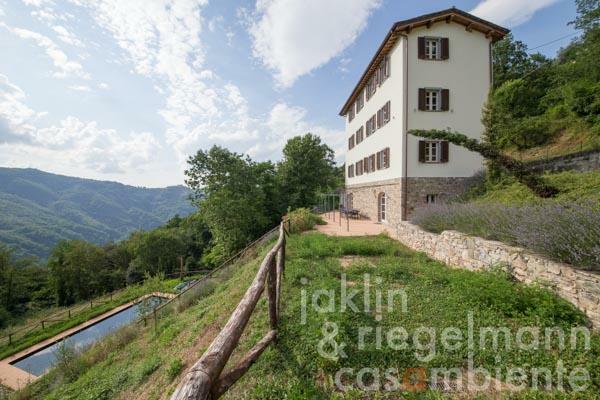 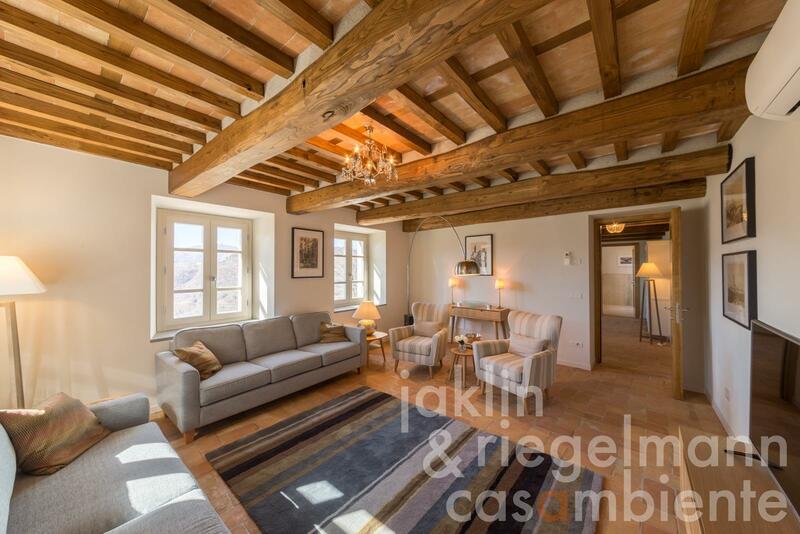 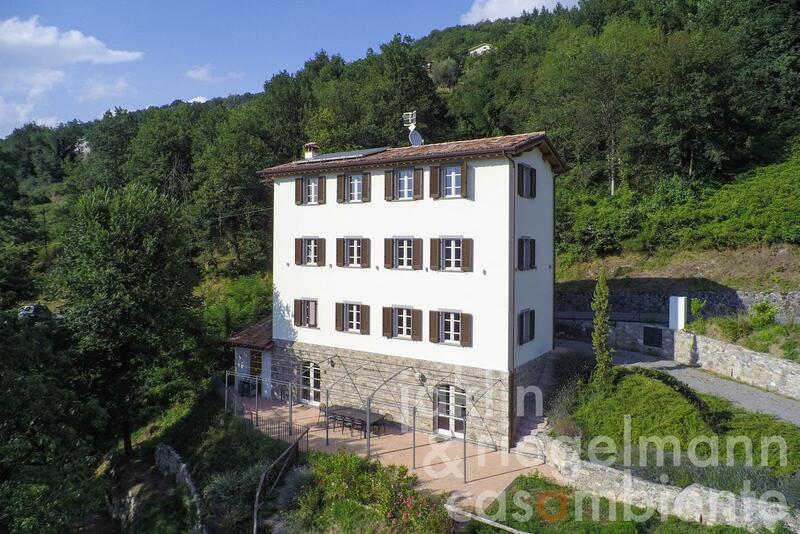 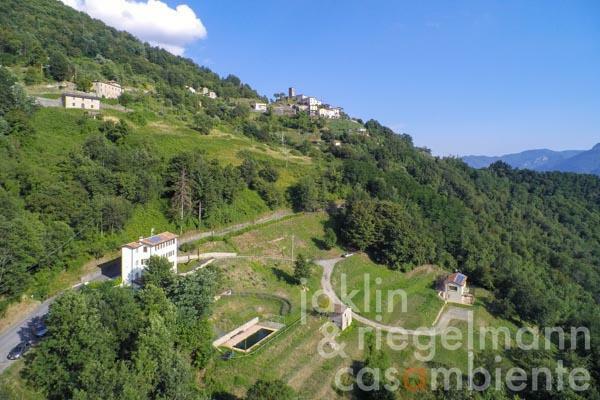 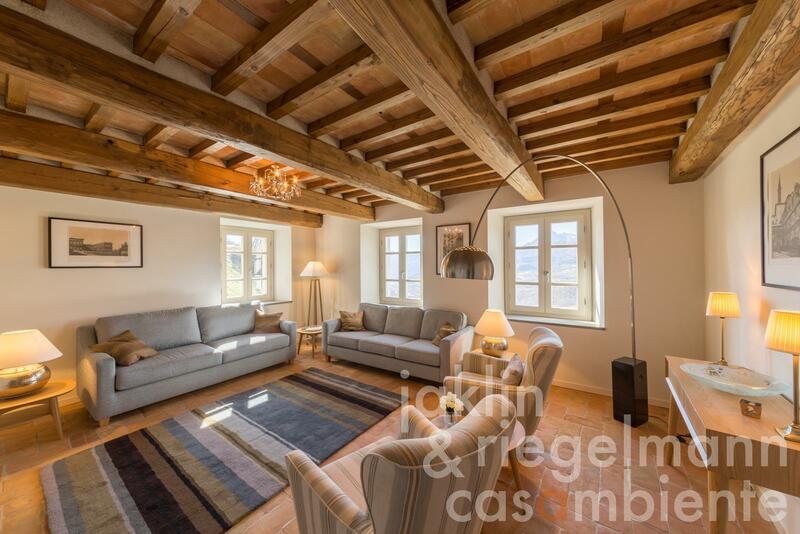 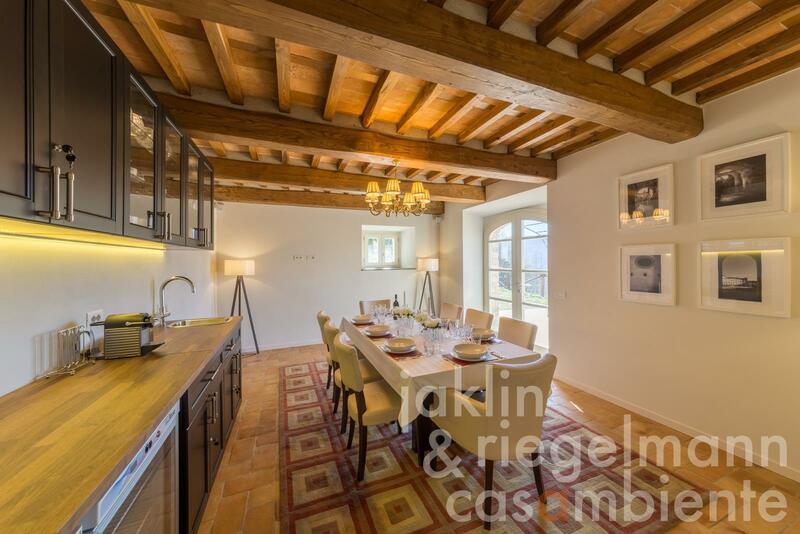 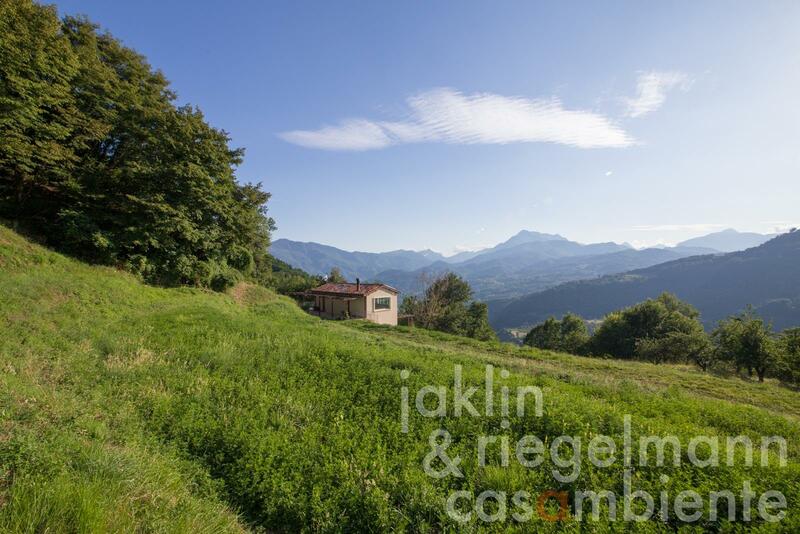 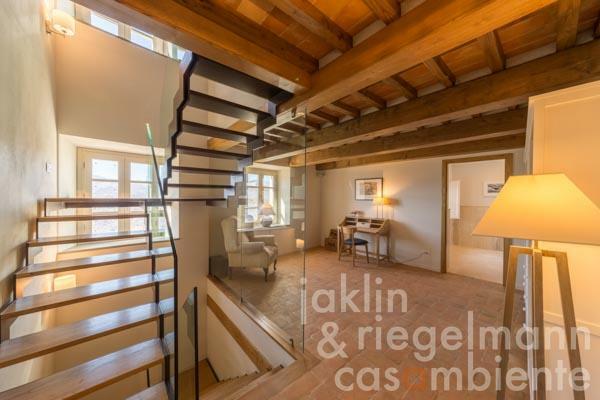 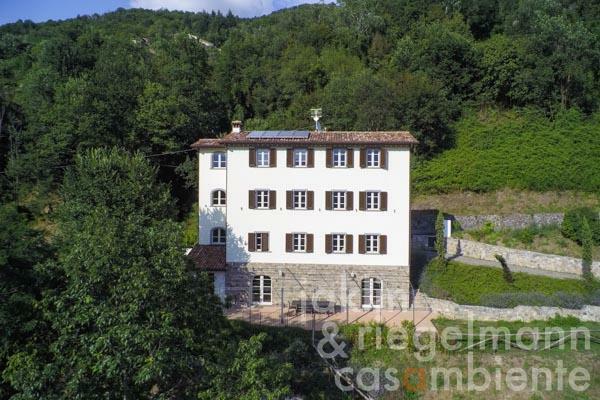 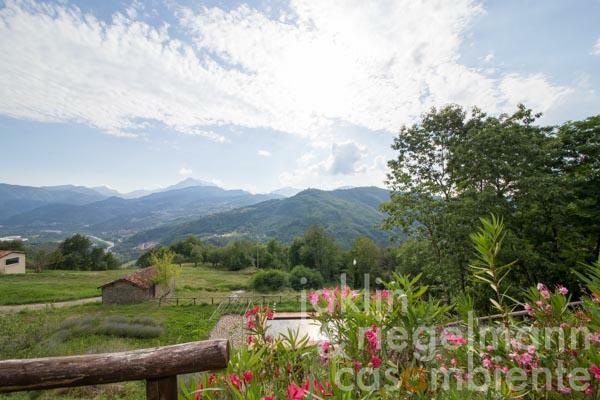 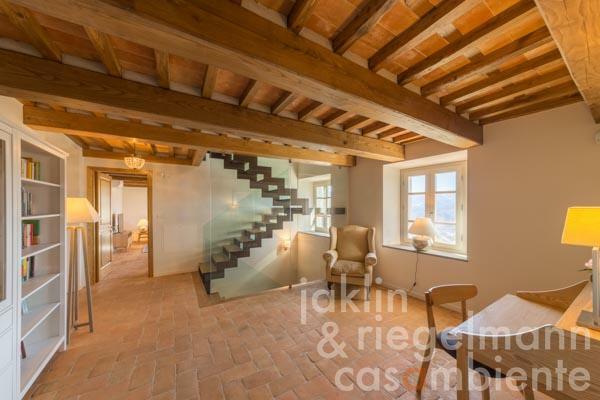 This authentically restored historic estate for sale is located close to Barga in the Garfagnana region in Tuscany. 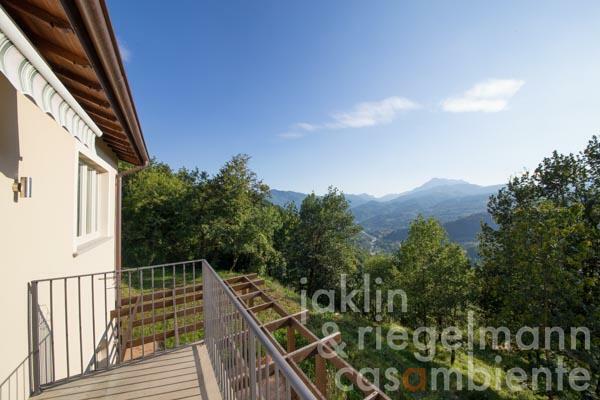 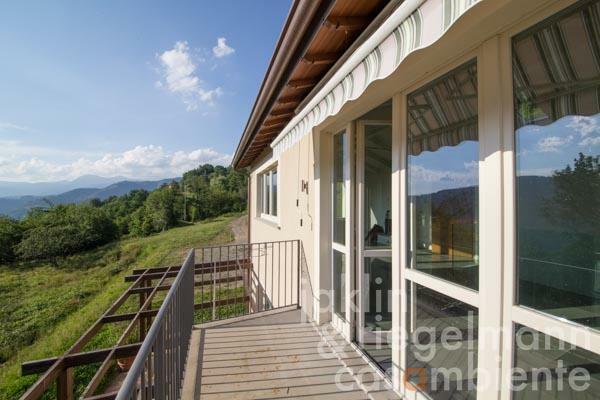 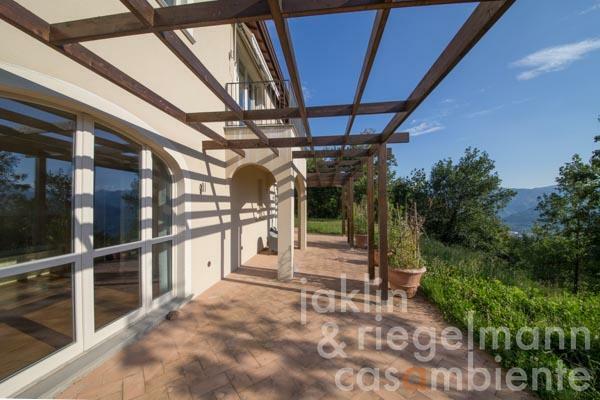 The villa of the estate faces south-west and every room has a breathtaking view onto the Apuan Alps. 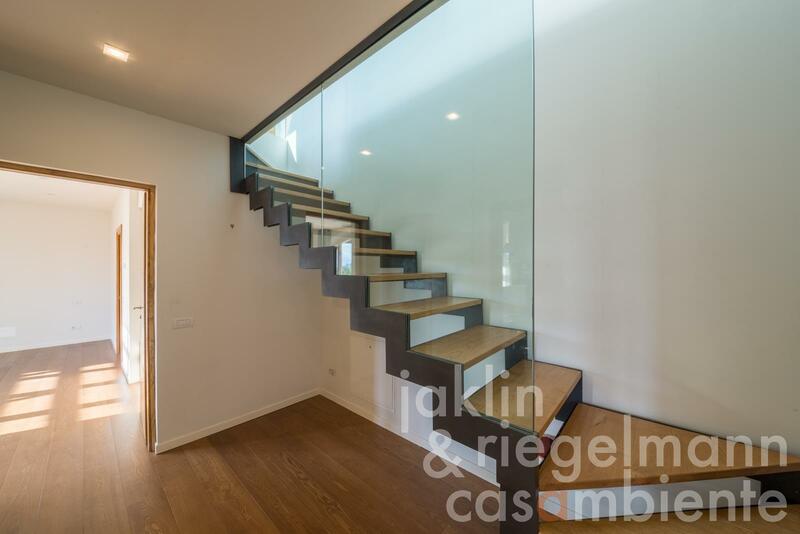 The villa has four double-bedrooms with four en-suite bathrooms, a large sitting room, study, fully-fitted kitchen and a spacious dining room, all connected by an innovative steel staircase with glass banisters and chestnut treads. 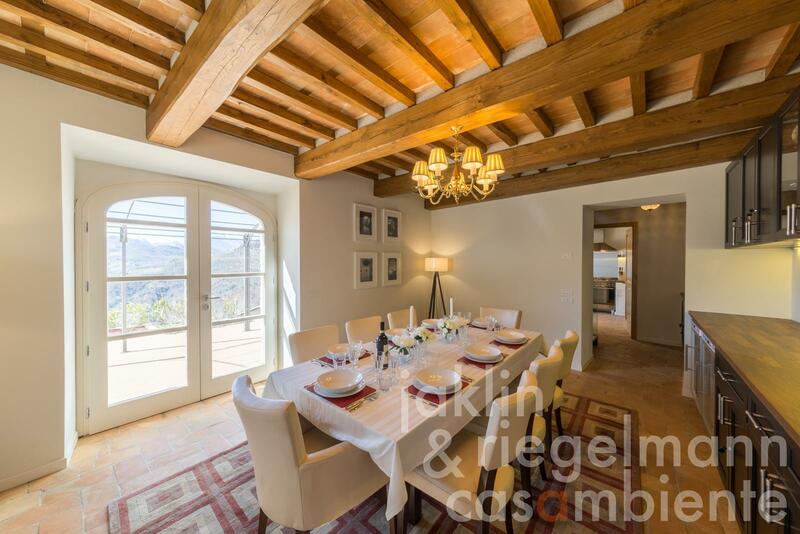 The spectacular panoramic dining terrace, with shaded pergola, is accessed through French windows from both the kitchen and dining room. 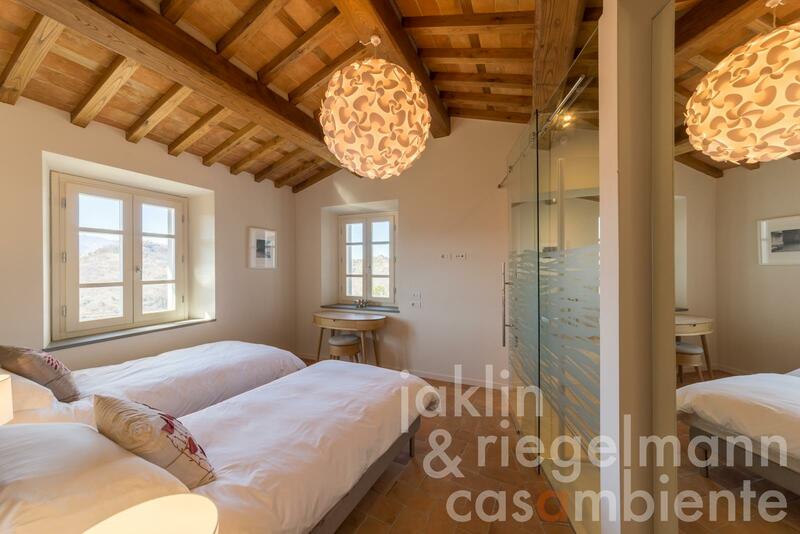 A private heated swimming pool with spacious sun terraces and pavilion is located below the villa. 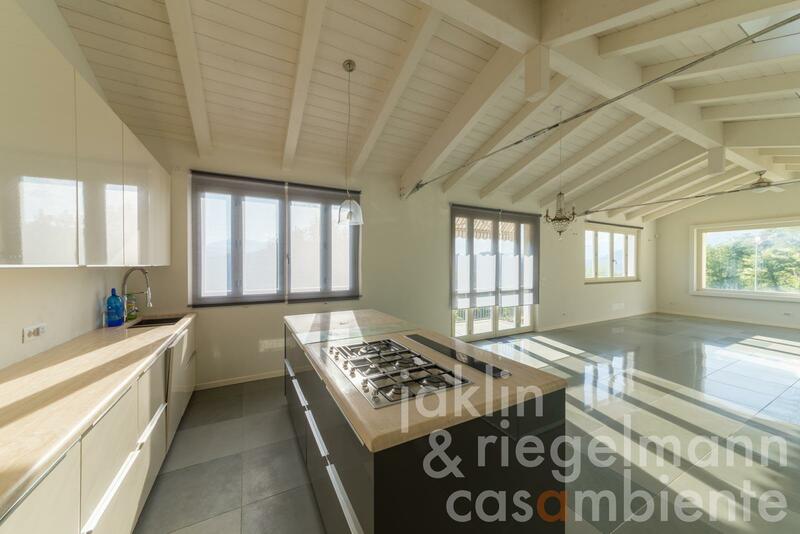 A second newly built house is located below the villa and offers two bedrooms, two bathrooms and a large and bright living and dining area with a modern open kitchen. 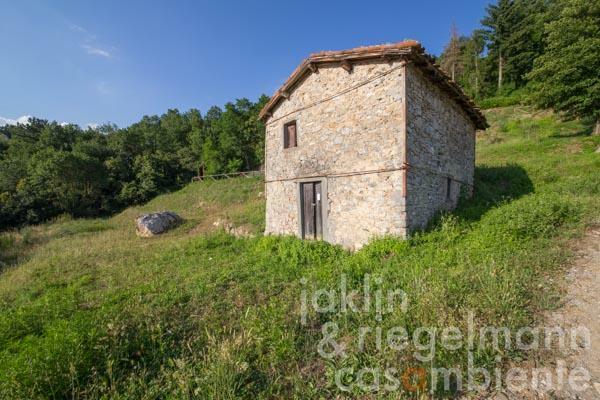 A former barn of approx. 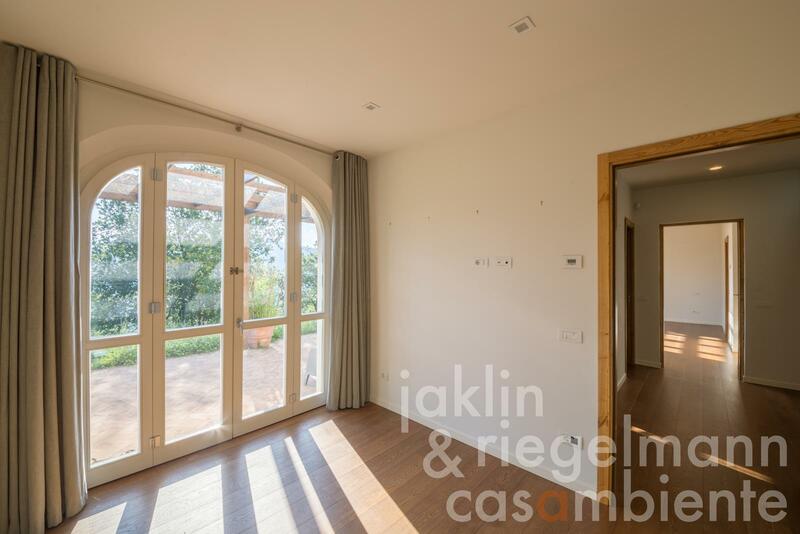 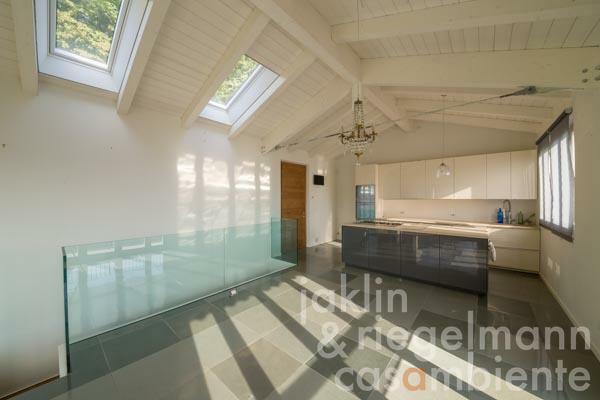 60 m² can still be converted. 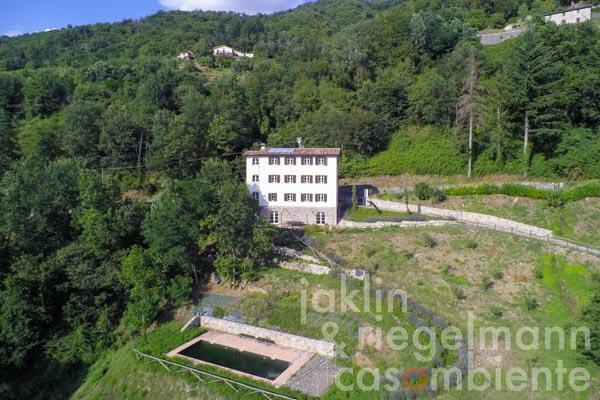 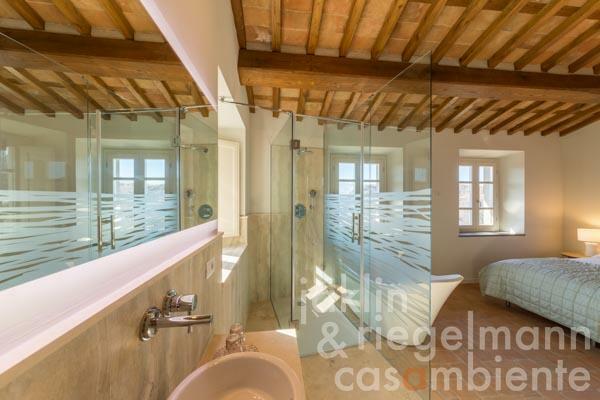 The property comprises around 2 hectares of land, some terraced, with 25 olive trees. The estate features a traditionally rendered exterior, the villa has shuttered windows, local stone sills and Tuscan painted architectural details – a truly authentic restoration. Inside the villa we find authentic chestnut beamed ceilings with handmade terracotta tiled floors laid to a traditional herringbone design. 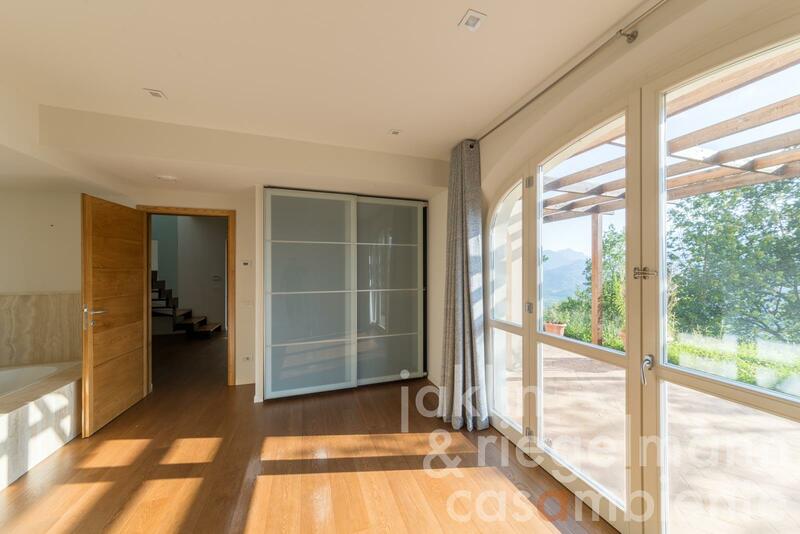 Solid chestnut doors - sound-proofed for the bedrooms – were handmade by a local craftsman. 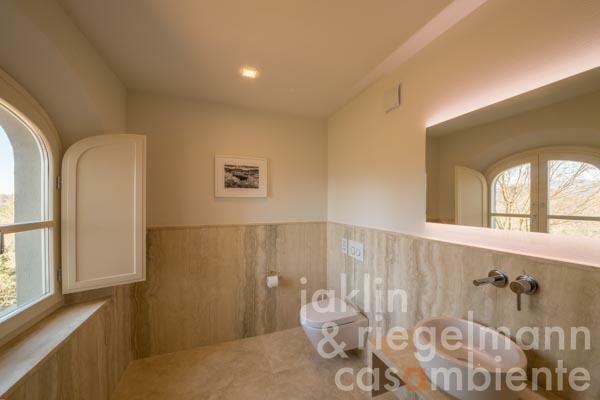 Villeroy & Boch and Grohe bathrooms are finished in Siena travertine, with custom-made glass walls and walk-in shower cubicles. Two of the bathrooms have standalone marble bathtubs with a view. 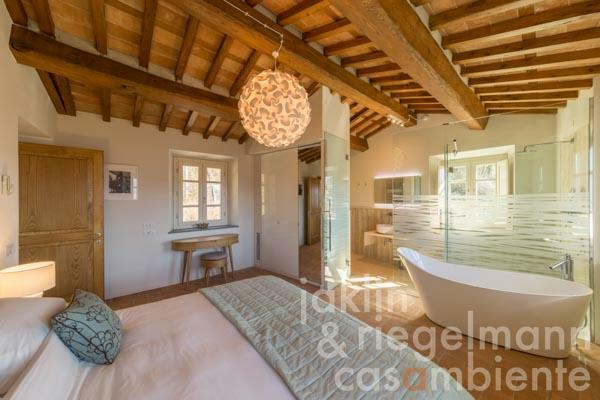 The full restoration allowed for inclusion of the latest eco-technologies, such as roof-mounted solar panels, providing hot water and electricity, which are supplemented by a biomass pellet boiler, a highly-efficient heat pump technology for pool heating, thermally-efficient window glass as well as an energy-saving insulating jacket surrounding the buildings, discrete underfloor heating as well as air-conditioning, LED lighting and wi-fi throughout. 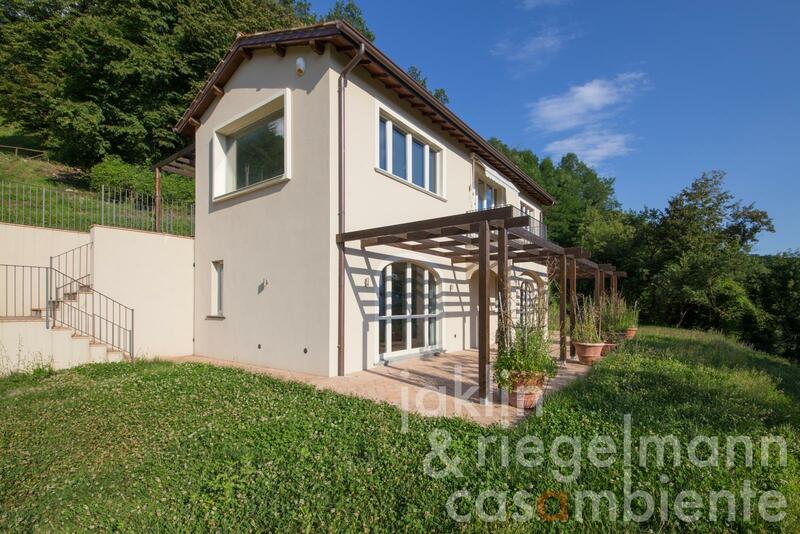 The property is private and away-from-it-all, yet easily accessible from an international airport: Pisa. 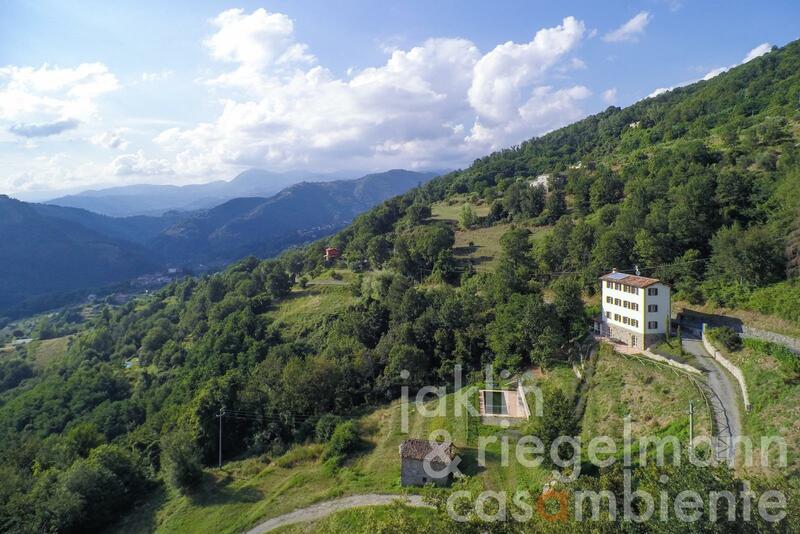 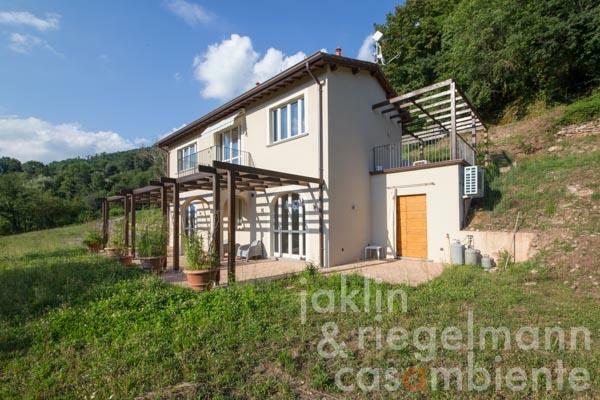 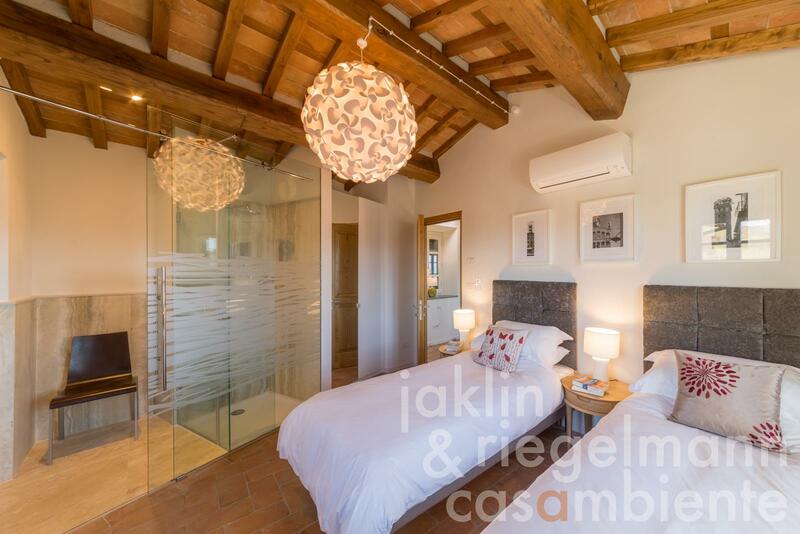 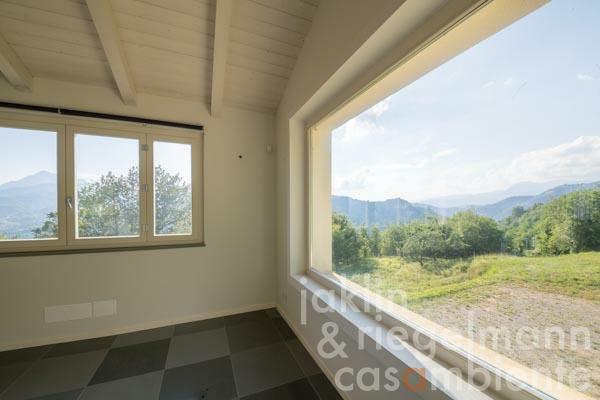 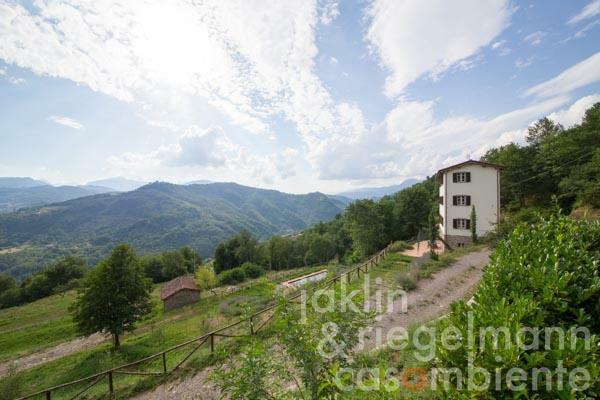 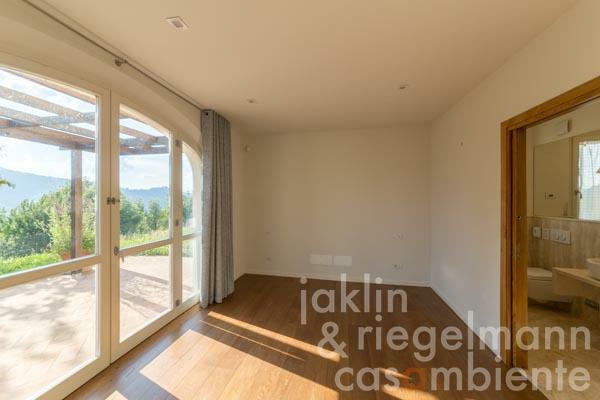 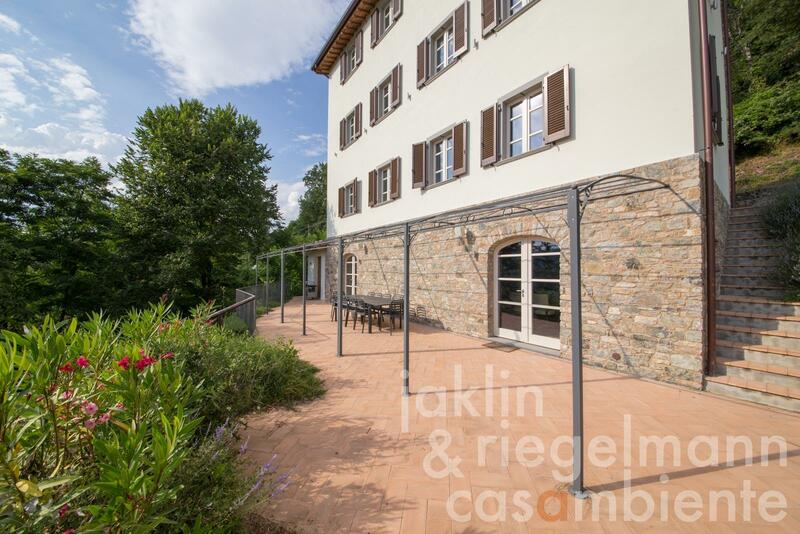 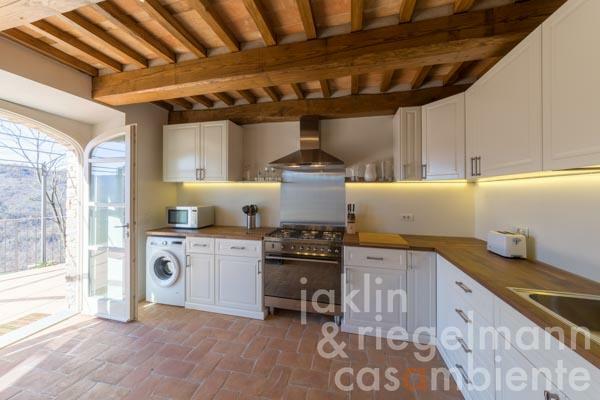 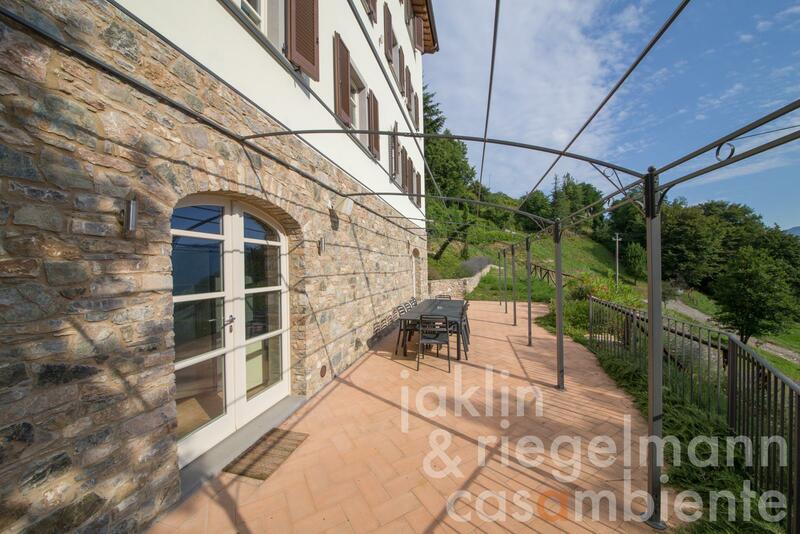 Located in the heart of northern Tuscany with breathtaking views and close to local facilities with two bars and a mini-market just minutes away. 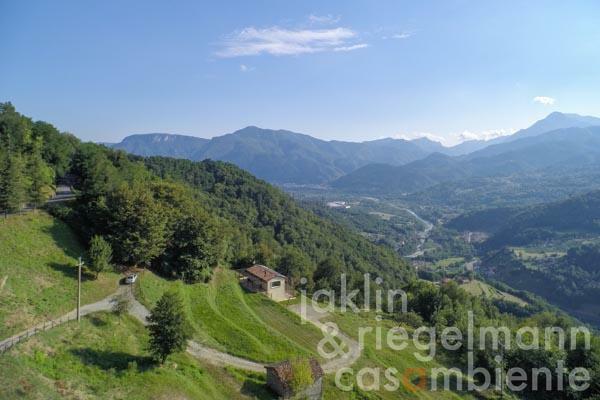 There are sufficient places of varied interest within easy reach, such as Barga (one of Italy’s “Borghi Più Belli”), the busy market town of Castelnuovo di Garfagnana, the mediaeval and renaissance gem of Lucca, well-known Pisa, Abetone (skiing), the Tuscan coast (Forte dei Marmi, Lido di Camaiore, Viareggio) and the Cinque Terre. Italy, region Tuscany, province Lucca, municipality Barga. 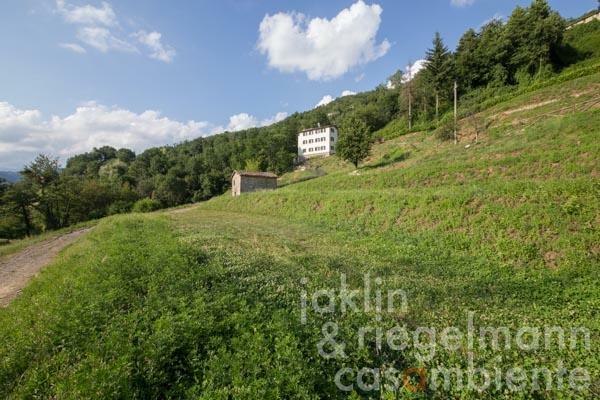 2.19 ha with partially terraced gardens. Electricity, photovoltaic modules, mains water, own spring water, central heating, solar thermal system, underfloor heating, air conditioning, telephone, broadband internet access, satellite-TV, alarm system, irrigation system, swimming pool, private parking, terrace, garden. 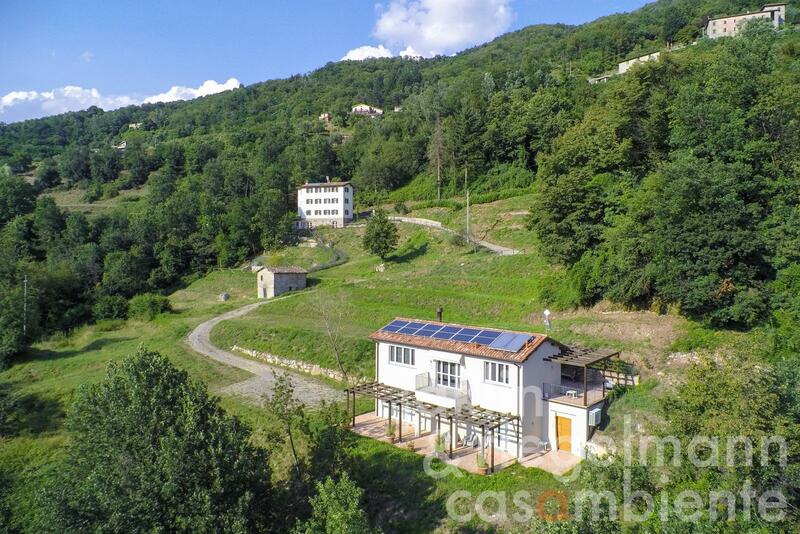 Energy source: biomass, electricity, solar.